In this new edition, Dr. George Tomlin joins Dr. Martin S. Rice and Dr. Franklin Stein to add expertise and knowledge of the occupational therapy field. With the combined knowledge and skills of the authors Clinical Research in Occupational Therapy, Sixth Edition includes many valuable updates and enables the graduate student and clinical researcher to carry out a research study from the formulation of a research hypothesis to collecting, analyzing, and interpreting data in user-friendly, step-by-step procedures. Clinical Research in Occupational Therapy, Sixth Edition is a valuable resource for students, clinicians and researchers. The text can be used as a complete self-tutorial that provides the reader with the knowledge and skills to design and carry out a research project, from hypothesis through data collection and analysis. The text is written to help the reader evaluate the quality and rigor of research studies. 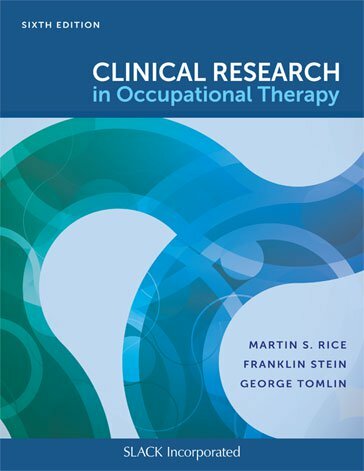 The Sixth Edition incorporates recent research in occupational therapy to help the reader design a feasible research project and understand and appreciate the literature of the field. Martin S. Rice, PhD, OTR/L, FAOTA, is the Dean of the School of Health Sciences, and Professor of Occupational Therapy at the Indiana Wesleyan University in Marion, Indiana. Dr. Rice received his PhD in 1996 in Motor Learning and Control and his BS in 1984 in Rehabilitation Education from the Pennsylvania State University. In 1987, he received his MS in Occupational Therapy from the Western Michigan University. Dr. Rice has served on the editorial boards and as a reviewer for several rehabilitation sciences and occupational therapy peer-reviewed journals. He has published over 50 articles and has given over 100 presentations regionally, nationally, and internationally. He completed a sabbatical at the Sheffield Hallam University where he studied safe patient handling practices within the United Kingdom. George Tomlin, PhD, OTR/L, FAOTA has degrees from Massachusetts Institute of Technology, Boston University, University of Puget Sound, and the University of Washington in philosophy, international relations, occupational therapy, and educational psychology, respectively. He has enjoyed 35 years of teaching occupational therapy to students at Puget Sound, from those who grew up locally in Tacoma, Washington, to those from far away: India, Iran, Norway, Taiwan, Germany, Australia, Jordan, and the West Bank. He has brought practice experience in pediatric mental health, adult rehabilitation, and vocational rehabilitation, as well as teaching experience and research interests, to faculty, therapists, and students overseas, especially in Germany and other parts of Europe. Since 2006 he has continued a collaboration with Prof. Dr. Bernhard Borgetto, at the University of Applied Arts and Sciences, Hildesheim, Germany, advancing the ideas of the pyramid model of research evidence. From 2007 to the present he has served as a volunteer for the National Board for Certification in Occupational Therapy, first on the teams developing clinical simulations, and currently as a member of the Board of Directors. His newest project is with a group of six U.S. colleagues, investigating a more inclusive understanding of the uses of evidence in practice, and of how therapists make and justify intervention decisions.